With the Super Bowl and the Oscars on the horizon, it is time to make some healthy appetizers. This one is simple and features cauliflower. I have been criticized for my love of cauliflower but I continue to cook with it no matter what the consequences. One of my favorite recipes is incredibly simple – Smoky Cauliflower Recipe. All you do is roast it and add smoked paprika. Cauliflower is a great vehicle for other flavors because it is so bland – and your family or friends might not even realize you served them something healthy. Another favorite of mine is to turn cauliflower into alfredo sauce for pasta or whatever you want to use it for. 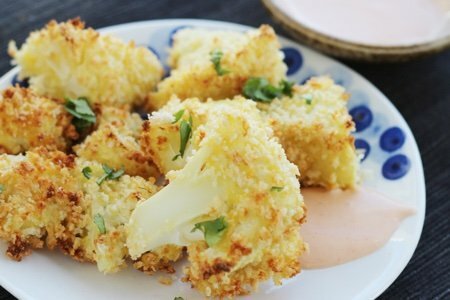 I love how the cauliflower can taste like cheese and no one will know that you snuck in cauliflower. My kids are sick of me sneaking cauliflower into everything (though they may be getting used to it). I don’t really think of it as sneaking. I think of it as being creative! Cauliflower is so good for you -it is an excellent source of vitamin C, vitamin K, folate, pantothenic acid, and vitamin B6 and it is low in calories and high in fiber. It is one of those super foods that your doctor is always trying to get you to eat – and if you just treat it correctly with a little love – it isn’t a chore like some other stuff (chard – I am looking at you). 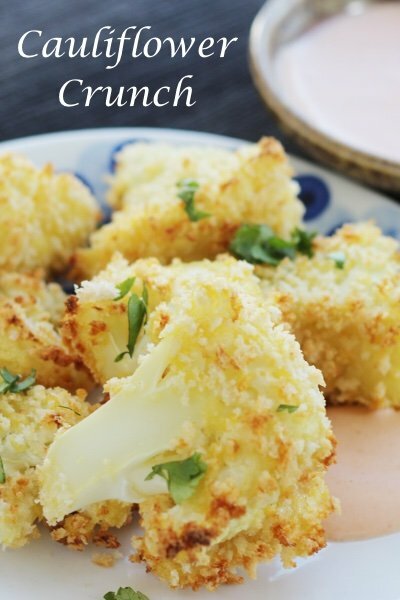 The cauliflower in this cauliflower crunch recipe need some kind of sauce to make it work. I mixed mayo and Frank’s Red Hot but you could use a less calorie sauce such as green salsa or simply Frank’s Red Hot (which has zero calories). Serve this as an appetizer or a snack. I love to eat this instead of potato chips when I am watching the game. You have plenty of time at half-time to toss this together and be back for the action. Do yourself a favor and don’t tell everyone how good cauliflower is for them. They might start bugging you for deep fried mozzarella sticks if they think you are trying to serve them something that is healthy. Looks delicious! Sadly a cauliflower currently costs $8 in Canada...! It is on sale for $1.98 at food basics and $3.99 at Sobeys's in Ontario. Hope we have seen the last of $8 cauliflower. Snack Girl, this looks delicious! Could I use brown rice breadcrumbs for this? And for the sauce, could I use safflower mayo instead of regular mayo? Thanks. I shared this on FB for all my recipe-sharing FB'ers. My two favorite ingredients, ''healthy'' and ''delicious''! Thanks Lisa, will give this a try this week because it seems easy and fast. I usually just steam & mash as for mashed potatoes. Has anyone tried to crumble it into ''rice'' & stir-fry it? I haven't been able to experiment with that yet. To reduce SmartPoints (i.e. to be able to have more than 3 bites for 1 SP), I think I'd try this with egg whites, garlic powder, & a little spray butter (I'd skip SG's sauce as I don't like hot sauce and don't want SP from mayo!). Another good dipping sauce is Frank's Buffalo Wing Sauce. Delicious and low calorie! Amazing! Made these tonight. I added some garlic powder to the bread crumbs because I don't do hot sauce and wanted some flavor. You could honestly add any type of spice you wanted. I am not a believer in cauliflower replacing mashed potatoes or rice. Love my carbs! However, I had these with my chicken tonight and didn't even miss the potatoes or rice! Such a satisfying crunch and flavor even without a dipping sauce. These will be added to my weekly menu from now on. Thanks much! This recepie is delicious. If you have an aldies grocery store check it out. Prices for fresh fruits and vegetables cannot be beat. This sounds delicious. I'm going to try it tonight with fish. Thank you very much!